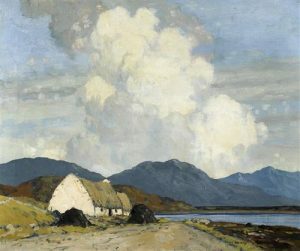 Paul Henry, Connemara Landscape sold for 100,000 at hammer. Paul Henry’s Connemara Landscape was the top lot at Whyte’s sale of Important Irish Art in Dublin last night. 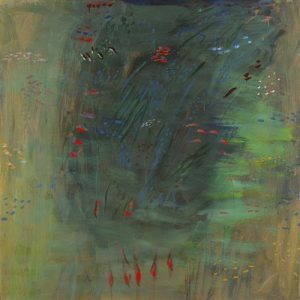 It sold for 100,000 at hammer. A second Henry, West of Ireland Road through the Bog, made 82,000. 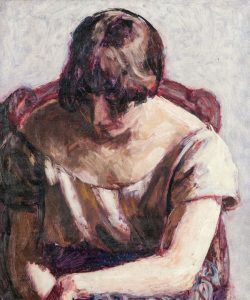 Both works were sold to a collector in Co. Clare. Sean Keating’s 1924 work Salud made 52,ooo. 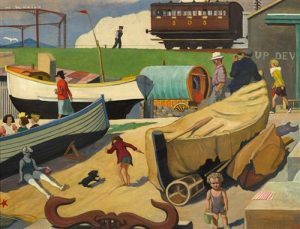 Gerard Dillon’s West of Ireland Couple and Horses sold for 36,000 and another Dillon, The Fish Eaters made 24,000, Miscellaneous Objects by Harry Kernoff sold for 28,000, Pond Reverie by Tony O’Malley made 22,000, a triptych by Barrie Cooke made 18,000 and Trapeze I by John Shinnors sold for 16,000 at hammer. 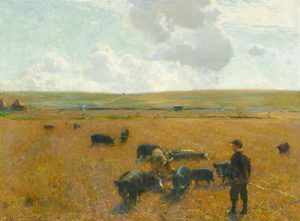 The top Yeat’s in in the auction, A Professional Man from 1905, failed to find a buyer and a Basil Blackshaw with an estimate of 10,000-15,000 was also passed. 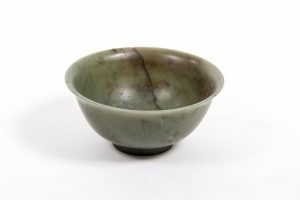 The sale total was 850,000, 80% of lots found buyers and a good number of sold works soared above the high estimate. Whyte’s next sale is on July 25. 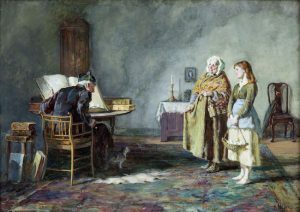 Howard Helmick (1845-1907) Presents for the Priest (1,500-2,000) UPDATE: THIS MADE 1,500 AT HAMMER. 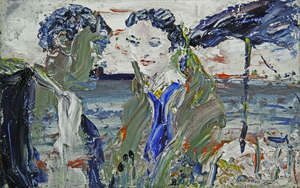 Strong demand for Basil Blackshaw, the Northern Ireland artist who died earlier this month, was evident at de Veres Irish art auction in Dublin on May 25. There were two works by Blackshaw in the auction. 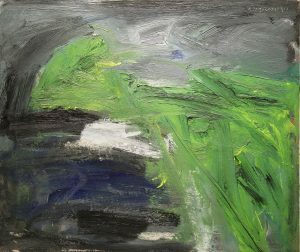 Lot 92, an oil on paper entitled Farmhouse in a Landscape was estimated at 3,000-5,000 and sold for 12,500. 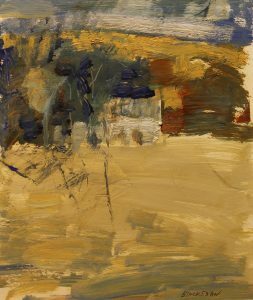 Lot 11, an oil on canvas titled Headland II dating from 1992, was estimated at 9,000-12,000 and sold for a hammer price of 11,500. The top lot in the sale was A Riverside Inn by Jack Butler Yeats which made 66,000. The Ferry Boat by Yeats sold for 61,000 in a sale where 80% of lots on offer found buyers. The sale total was 650,000. The noted curator Dr. Xavier Bray, whose appointment as next director of The Wallace Collection in London has just been announced, is a Ph.D graduate of Trinity College, Dublin. 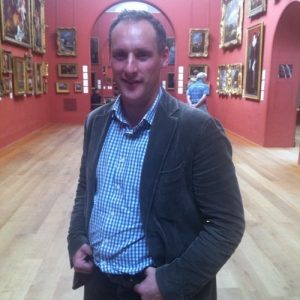 He is currently Chief Curator at the Dulwich Picture Gallery. 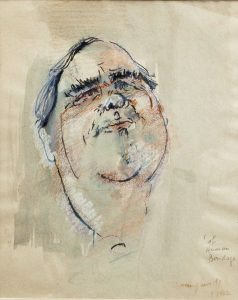 Dr. Bray, who was born in 1972 and holds British and French citizenship, was guest curator of the acclaimed Goya: The Portraits exhibition at the National Gallery in London, where he began his career as assistant curator. 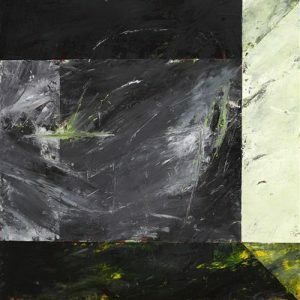 He worked for one year with Sotheby’s. He has curated and co-curated a number of exhibitions, which include: A Brush with Nature: The Gere Collection of Oil Sketches, An Intimate Vision: Women Impressionists, El Greco, Caravaggio, Velazquez, The Sacred Made Real: Spanish Painting and Sculpture 1600-1700, Murillo and Justino de Neve: The Art of Friendship and most recently, Goya: The Portraits. Xavier Bray said: “The Wallace Collection is one of the most distinguished collections in London, and a place where one can enjoy an intimate relationship with great art. I am tremendously excited and deeply honoured to be taking on the role of Director of such an august institution. I look forward to working with the staff in continuing and expanding its role as a national collection”. These Meissen ewers made 53,000 in total. 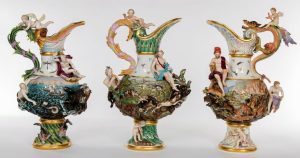 A set of large Meissen ewers representing three of the four elements proved their worth at Mealy’s sale at Lotabeg in Cork on May 24. The auction of contents from Lotabeg was a crowd puller which drew more than 7,000 viewers. The top lot was Sir Peter Lely’s portrait of the 1st Duke of Ormonde (120,000). 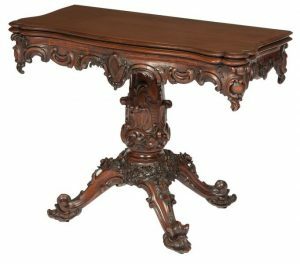 A rare William IV seven foot circular dining table went for 26,000, three Meissen ewers sold for 53,000 collectively, an early set of c1864 photographs of Hindustan, Kashmir and Tartary made 12,000, a pair of paintings by David de Coninck sold for 39,000 and an Irish silver coffee pot made 14,000. 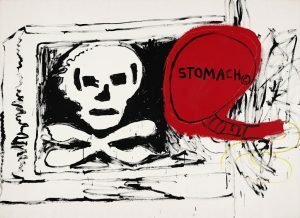 A monumental painting by Jean-Michel Basquiat and Andy Warhol from the collection of Elton John and David Furnish comes up at Sotheby’s in Paris on June 7. The two artists first met in a café in 1980, when Basquiat boldly approached Warhol – his idol who was then at the peak of his glory. This encounter led to a series of collaborations in the early 1980s, including this untitled work estimated at €700,000-1,000,000. Basquiat, overwhelmed by his own celebrity, saw Warhol as a protective alter-ego, while Warhol was captivated by the creative energy of his protégé. Sir Elton John met Warhol on numerous occasions. In 2003 Sothebys London sold the contents of Elton John’s apartment to the great enthusiasm of numerous fans. Over the years the British singer and his husband David Furnish have built up an extensive collection of contemporary art by iconic artists of the last five decades: Willem de Kooning, Louise Bourgeois, Gilbert & George, Tracey Emin, Damien Hirst, but also Andy Warhol and Jean-Michel Basquiat, their friend Keith Haring, and Julian Schnabel. Both visionary and inspired, the collection of Sir Elton John and David Furnish is not thus only a remarkable collection by its scope and quality, but also the result of a passion which says much about them. 150 photographs from the collection will be unveiled at the Tate Modern in an exhibition entitled “A Radical Eye: the Sir Elton John Collection” in November 2016. The wine sale in progress. 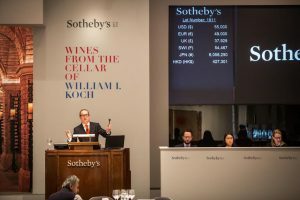 In what has turned out to be the greatest wine auction ever the cellar of William J. Koch achieved a total of $21.9 million over three days at Sotheby’s. 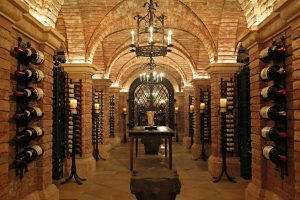 This set a record for a wine collection sold at auction. It was a white glove sale with 2,729 lots 100% sold and buyers from 23 countries. Highlights included the sale of ten bottles of Chateau Mouton Rothschild 1945 for $343,000: six magnums of Vosne Romanee Cros Parantoux 1989 Henri Jayer for $171,500 and 12 bottles of Montrachet Domaine de la Romanee Conti 1978 for $147,000. William I. Koch commented: “Collecting and enjoying wine has been one of the great joys and loves of my life. It is very gratifying to see so many people from around the world that share my passion”. 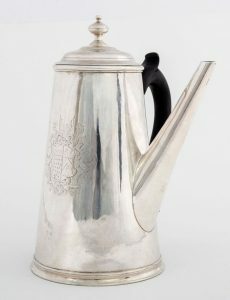 The most expensively estimated piece of silver at Mealy’s sale of contents of Lotabeg House in Cork on May 24 is a George I silver coffee pot by John Hamilton. It is estimated at 15,000-20,000. The auction is strong in provincial Irish silver including a rare Republican silver strawberry dish by William Egan (5,000-8,000). Republican silver made in Cork during the Irish Civil War could not be sent to the assay office in Dublin and is of great interest to collectors. Other Cork pieces include a set of bright cut dessert spoons by William Reynolds (650-800), a Cork crested salver by George Hodder (1,500-2,000) a George II silver punch ladle by William Bennett (2,000-3,000), an asparagus tongs by Carden Terry (2,000-3,000), a double bowl marrow scoop by John Warner (800-1,000), teaspoons by Jane Williams (150-250) and a set of 12 silver table forks by Carden Terry and Jane Williams (5,000-7,000).